Holidays can sometimes be emotionally challenging, especially when you are trying to conceive. Families often gather together to catch up, and children are typically the focus of attention (either the ones physically present, or in the form of the typical ‘So when are you going to start trying?’). It does not matter if you welcome the holiday as a celebration, or you experience more solemn emotions. They are your emotions. They are perfect, and normal. Grief is also a common emotion and process around the holidays, especially after pregnancy loss. If you would like to read more on grief, please visit Understanding the Grief Process. The winter holidays focus on gifts of family, heritage, and faith. While this is a time of reflection and celebration, some of the traditions may cause sadness and anxiety. Exchanging gifts with children and watching them celebrate such a festive season can trigger many unexpected and unwelcome emotions. While we cannot eliminate the sadness and anxiety surrounding your fertility at this time, we can prepare and create new traditions that are more welcoming to where you are at this moment. 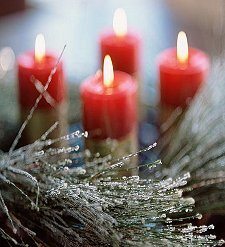 I have gathered a few suggestions and coping tools for you to explore as you prepare for the holidays. I do suggest that you begin thinking about your holiday plans and how they might impact your emotions beforehand. It is better to plan and anticipate the holidays, than find yourself overwhelmed with challenging emotions. 1. Be your best friend: You are not required to be anywhere or do anything you are not comfortable with. You have to listen to yourself, and protect yourself. You (and your partner, if you have one) must have a discussion before, outlining the most enjoyable and least stressful holiday scenario: Where will you celebrate? How long will you stay? What do you want the focus for this holiday to be? How can you expand that area (time with family, a great meal, a religious service, giving to those who are less fortunate, etc.) and minimize the stress and distraction of what you feel like you “should” do? 2. Prepare your script: This does not mean you will have each conversation planned out, but come to a consensus beforehand. How will you respond to the inevitable question, ‘so when will you have children of your own?’ If you have a couple of planned responses that you feel comfortable with, it will make the conversation much more fluid and brief. When we become anxious about answering a question, it can often lead to us revealing more than we would like. If we are able to calmly deliver our planned responses, we can guide the direction of the conversation to another topic rather smoothly. If you have told your family you are trying and seeking treatment, this tool also works. They may ask ‘how are your cycles going? What is new at the doctor’s office?’ and instead of giving them a play-by-play of your last blood draws, you could have similar, planned responses. 3. Throw yourself into the holiday: What better way to focus on the positive, than to enjoy a beautiful holiday? Try cooking a special meal or decorating the house. Find a way to volunteer or give back to the community. If you are spending a quiet night with your partner, make a special meal and reconnect. 4. Create a new tradition: If being surrounded by children opening gifts is too much at this time, create a new tradition with your partner and friends. Do something more adult-oriented that is festive. This is a wonderful opportunity to reconnect with the ones you love, while also receiving a bit of extra support. 5. Recognize and honor the emotions, but celebrate with family: This may be an opportunity to use as motivation for your cycles. Try to take it all in. Take a mental image of the smiles and laughter, and when you are experiencing a challenging moment later on, remember those smiles and what it is that you are working towards. You are doing all of this so that you can have those moments, those smiles, for yourself. Please remember it is incredibly important to protect your emotions, and if that means removing yourself from a situation that could be too challenging, then do it! We just need to get a bit creative, and open ourselves to new traditions and opportunities. For all of our fertility support offerings this month, please check our CNY Fertility and CNY Healing Arts calendars. Please let us know if you have any questions, and we look forward to hearing from you during these sessions!